Isabel Carden, daughter of the seventh baronet (1926-2008, Templemore branch) lives in New York. In the Queen's birthday honours in June 2012 she became an MBE. The citation was Ms Isabel M Carden, Director, The Queen Elizabeth II Garden, New York. For services to the UK/USA business and British Community interests in New York. 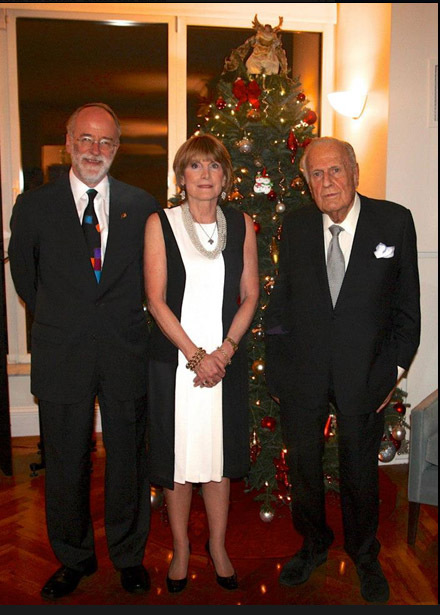 The picture alongside shows Isabel between two other recipients of honours, at a reception held on December 10 at the British Residence in New York held to congratulate the three of them (Isabel Carden MBE, Richard Fursland CBE and Sir John Richardson KBE). I have met Isabel on a couple of her visits to London. Isabel is my 6x CuZ'N, I would really like to learn more of this family.